These instructions show how to setup your SMC Wireless Router to open certain ports in the firewall when C&C Generals tries to create or connect to a Online game. NOTE: This configuration is only for those experiencing connection problems setting up a game Online in C&C Generals behind a SMC Wireless Router/Firewall, although other SMC firewalls might work with similar setups. 1. Go to the configuration program for your router. To do that open MS Internet Explorer and in the address box type http://192.168.2.1 (this is the default IP address for the SMC Wireless router; if you did change this address then you should type the address that you entered the first time that you configured your router). You’ll be prompted for your login and password. If you have never changed your password use the default one. Look for it in the SMC instruction manual. 2. Now you should be at the Main Menu of the SMC setup program. Click in the menu named NAT, then click in the sub-menu named Special Applications. 3. Here we have to set-up one rule per computer connected to the Router that will be used to play C&C Generals. c) Repeat this process adding a new rule per computer that will be used to play C&C Generals online. As you can see in the example below we have setup forwarding rules for just 2 computers. d) Once you are done click in the Apply button. 4. 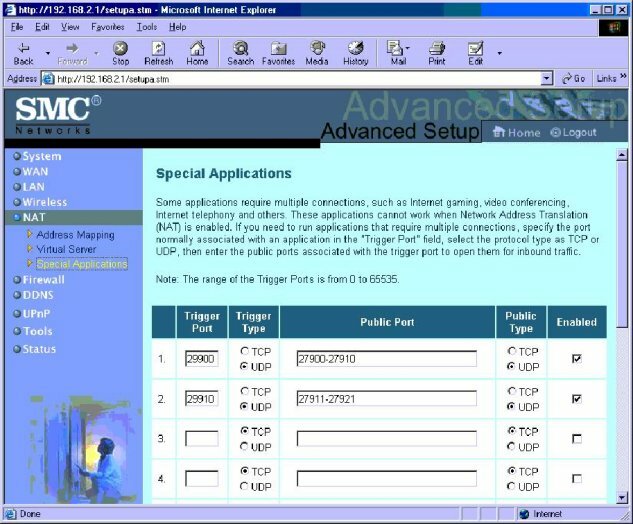 Now you have setup each of the computers so each one uses a specific port in your firewall to initiate the connections. e) Save the file and repeat this process in the other computers, changing the FirewallPortOverride value to the correspondent Triggering Port that you defined while setting up the router (Point 3 of this document). 5. Now start the game in each computer and go to the Options menu, then click in the Refresh NAT option. 6. You are ready to play C&C Generals Online.